Everything was going normal. My partner and I were using an 8-inch dredge, pumping rich gold from underneath about seven feet of hard-packed streambed. It was just another day in god’s country. Then, without any warning, we ran out of air. “Out of gas,” I thought. As I turned around to go back to the dredge, there it was, upside down, with the engine muffler resting on the bottom of the river! There are few things more disheartening in gold dredging than flipping your dredge upside down in the river! But if you spend some time talking with experienced dredgers in river-dredge country, you will find a good percentage of operators have experienced turning one or more dredges over at one time or another. Dredges get flipped over because of numerous different factors. One common reason is not having enough flotation under the dredge. Another is having a dredge design where the dredge is not wide enough. Another common problem is in dredge designs whereby the forward-most floats are not tapered enough to help deflect the river’s flow. Design problems aside, there are two common situations which cause dredges to flip over. The first is when something happens to cause the sluice box to start loading up with the material you are pumping. As more and more material piles up in the sluice box, and then perhaps onto one of the pontoons, the increased weight eventually overwhelms the dredge’s floatation capacity, and over she goes! This can happen in minutes if you are feeding the nozzle at production speed! The second common reason for flipping a dredge is floating it out into faster water than the design can manage. Every dredge has its limits! A dredge which might float just fine in shallow, slack water might not last five minutes in the faster flow of a river. As fast water often poses more risk to the dredge than an experienced operator, sometimes you have to find some slack water along the edge of the river where it is safer to float the dredge! Gold quite often deposits in the fast water sections of a river. Also, because of the faster water, these areas often have less gravel and overburden covering the pay-streaks. 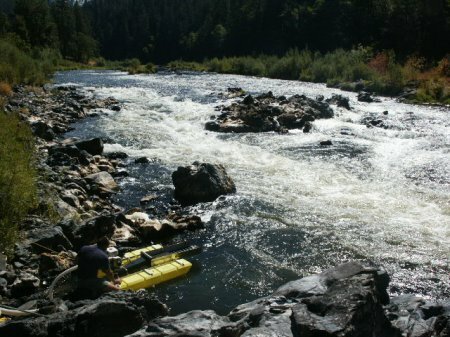 Less streambed makes sampling go faster. 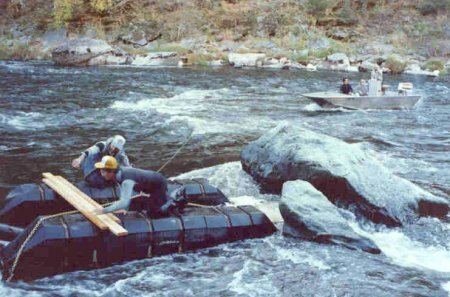 Consequently, river dredgers often find ourselves dredging in the faster sections of gold-bearing rivers—including white water rapids. It is difficult enough to overcome the underwater problems associated with fast water dredging. Knocking out plug-ups in the suction hose is particularly difficult. A dredger should not also have to worry about his or her dredge flipping over at the same time. Therefore, a certain amount of dredge modification might be necessary on any store-bought dredge before it is used under fast water conditions. Normally, dredges are modified for fast water by adding more flotation—sometimes to the sides, sometimes to the forward-part of the dredge. Here’s something important: Additional side flotation tends to make the dredge more stable from side to side and generally prevents the flipping problem. However, additional side flotation enormously increases the dredge’s water drag in the fast current. This puts a great deal of pressure on the tie-off lines, and it also makes it more difficult to get on and off the dredge, or work around the dredge (knocking out plug-ups) without getting swept down river. This is because the additional drag directs a larger volume of water around the sides of the pontoons. It is usually more difficult to mount additional flotation as an extension of the front of your dredge; but we have found in our own operations that this is the better overall modification for several reasons. Reduced water drag is very important in swift water conditions. More floatation up front helps prevent the dredge from doing a submarine dive! Also, the additional platform in front of the dredge provides more space to place support gear on your dredge. And, in the case of larger dredges, if you should ever want to mount a winch on the front of your dredge, the extra flotation and frame will already be in place. But you do not need to be in fast water to flip a dredge over. As mentioned above, a very common reason for a dredge to flip over during operation is sluice box load-up. This is when rocks and gravel overwhelm the sluice box, start flowing over onto the decks, and eventually cause the dredge to list over to one side and flip. If you have a water-flow problem with your recovery system, the problem must be resolved before you operate your dredge without someone at the surface to keep an eye on it. The key is to get enough water-flow to keep all of the rocks and material moving through and out of the recovery system. We always make sure we have a little more flow than necessary, because we choose not to hire a dredge tender to stay on deck. Occasionally, even with a dredge which is set up perfectly, just the right rock can lodge in the sluice box and create an obstruction. Then that single rock can be the cause of a sluice box load-up. If not caught in time, the load-up can collect enough weight to flip the dredge over. This is why I say many experienced dredgers have had the fun (not) of flipping a dredge. Helpful hint: It never hurts to look back every once in a while to make sure your dredge is floating alright! Tying off the dredge properly in swift water is also an important factor in preventing a flip-over. Obviously, you do not want your dredge sitting broadside in a fast current! It is a matter of applying Murphy’s Law: you must observe the water-flow and its effect on the dredge. If it looks chancy, come up with another plan. hanging by just one pontoon. The guy was dredging when we started our dive, so we assumed he was still underwater, pinned by a rock, or perhaps knocked in the head by the dredge when it flipped over, or something. Because the owner of the dredge was nowhere to be seen! However, it turned out that when the dredge flipped over, the dredger came to the surface and saw his other pontoon going downstream fast. 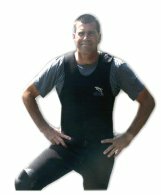 He off-loaded his dive gear and swam through three separate sets of rapids trying to catch the pontoon. These were the very substantial rapids on our Mega Hole claim at K-15A! He never did catch up with the pontoon. He showed back up at the dredge about 45 minutes later, exhausted and demoralized. We already had dragged the remainder of his gear out of the river. Using my jet boat, several hours later, we located his pontoon about eight miles downriver in a back eddy. It only took him several days to get his dredge running again. He installed extra flotation to prevent further such incidents. When a dredge is flipped over, after it is set right-side-up again, the water needs to be completely removed from inside the engine and hookah air compressor. We usually do about half a dozen oil changes, starting the engine for a few seconds each time, to remove more water. As long as the oil keeps turning milky, it is necessary to keep changing it. It is not as hard on an engine if it is not running when it goes underwater! Sometimes it is necessary to remove the electrical components and blow them out with air or replace them altogether in order to get spark at the spark plug again. The air compressor must have all water removed from inside, as well as the intake air filters and air lines. If the compressor was running when it was submerged, it will be necessary to pull out the reed valves and make them straight again or replace them. And of course, if you were dredging gold, some or most of that will have been lost from your sluice box when it flipped over. So, you will have to decide whether it is worth going through your cobble and tailing piles to retrieve it. It usually is not worth the effort, because you can get more gold by just continuing forward on your pay-streak. One important dredge modification worth doing is to secure the sluice box to the frame or deck of your dredge so it will not flap free in the current should the dredge become flipped over. This prevents the box from being damaged or lost altogether. It also makes it a heck of a lot easier to get the dredge flipped back over. At the end of last season, one of our local commercial dredgers was trying to winch his dredge up through a particularly difficult section of rapids on our K-17 property along the Klamath River. He was trying to test a potentially-excellent hot spot that no one else had ventured into, yet. The spot looked great; many pounds of gold were recovered just upstream and just downstream. The spot is probably still loaded with gold! He was moving the dredge alone, using a power winch anchored to the streambank some distance upstream. 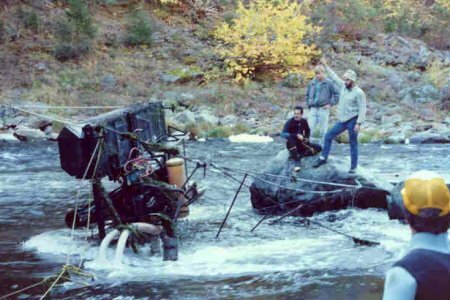 Just as he was almost around a large rock, the outside edge of his dredge took a dive and the dredge flipped over — just like that. This is the way it usually is in fast water; when something goes wrong, it happens quickly and decisively. Usually, there is little time to do anything effective about it. Besides all of the damage to a dredge, the loss of support gear, and the loss of production time, there is also a large amount of embarrassment which goes along with having a dredge floating upside down in the river! Once we found out about his problem, we put the word out, and experienced New 49’er members from the area converged on the site to help our friend. It is no small task to right an eight-inch dredge in fast water! The images in this article were captured as we made it happen. 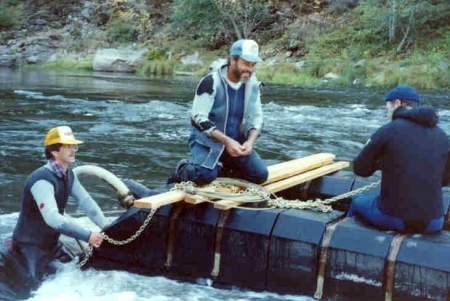 First, we had him winch the dredge around the rock and pull it into slower moving water. 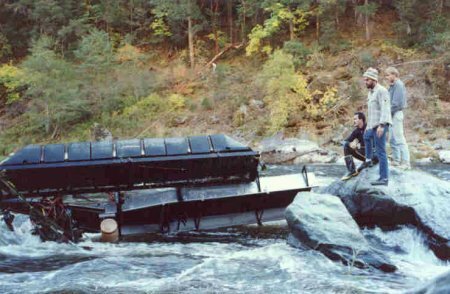 This did not help the equipment much, because his sluice box was dangling in the current and dragging along the river-bottom. His engine was also dragging the bottom. Not good! We spanned the bottom of his pontoons with some beams, and then cranked his sluice box back up to his deck before trying to winch the dredge back over. Then, we had several divers go under the dredge and use chains and a come-along to lift the sluice box up and secure it to the deck. We used a boat to set up an electric winch on the far bank. We secured the two outside corners of the dredge to the bank on the close side of the river. We secured the winch cable to the opposite corners of the dredge and we winched the dredge over. What a mess the dredge was! Since it was late fall anyway, this pretty-much finished the dredger’s season. Miners are a hardy bunch; he returned the following year, better and smarter than ever! The moral of the story is that a little prevention goes a long way. Another thing: we are dealing with the forces of nature. We use our observation and judgment. We take some chances and we are not always right. Murphy lives! And, when he wins a battle, it doesn’t mean he has to win the war. There is always another day and another opportunity. Another thing: We are dealing with the forces of nature. We use our observation and judgment. We take some chances and we are not always right. Murphy lives! And, when he wins a battle, it does not mean he has to win the war. There is always another day and another opportunity!